Inphi has begun sampling a 100Gbps/56GBaud platform solution for 100G QSFP28 and SFP-DD DR/FR optical modules for wired network infrastructure including hyperscale cloud data center, service provider, wireless 5G and enterprise networks. The new 100G platform is an expansion of Inphi's 16nm Porrima Single-Lambda Pulse Amplitude Modulation (PAM4) family, which includes field-proven PAM4 DSP technology, Linear TIA and Driver for PAM4 based client optical modules. Inphi said its Porrima 100G platform will enable the anticipated fast ramp of 100G DR QSFP optics inside megascale cloud data centers and wireless 5G deployment. Porrima 100G DSP supports all relevant IEEE PCS and KR/KP FEC options for legacy support and backward compatibility with 3.2T and 6.4T switches with 25G NRZ I/O. Citing an increase in demand for its "COLORZ" inter-data center solutions and coherent DSP products from its ClariPhy acquisition, Inphi reported Q3 revenue of $84.5 million (GAAP), up 19% year-over-year, compared with $70.7 million in the third quarter of 2016. Gross margin from continuing operations under GAAP was 49.8%, compared with 68.1% in the third quarter of 2016. The decrease in gross margin was primarily due to a Q3 impairment charge of acquired intangibles. GAAP operating loss from continuing operations in the third quarter of 2017 was $52.5 million or (62.1%) of revenue from continuing operations, compared to GAAP income from continuing operations in the third quarter of 2016 of $10.2 million or 14.5% of revenue from continuing operations. Inphi introduced its "COLORZ-Lite" 100G DWDM QSFP28 form factor modules for campus and data center interconnects spanning up to 20km. The company says its COLORZ-Lite hot-swappable devices can plug into any QSFP28 100G Ethernet port of any standard switch or router. COLORZ-Lite can support up to 40 DWDM channels on a single fiber. Inphi first announced its COLORZ 100G PAM4 platform solution for 80 km DWDM DCI last year. Inphi Corp. has expanded its 16nm Polaris PAM4 DSP portfolio for next generation 50G-400G cloud deployments. The new Polaris PAM4 DSP PHY ICs, which are now sampling, provide a full bi-directional interface with host ASICs that have 28GBaud PAM4 and NRZ electrical interfaces while bridging to 28GBaud PAM4 optics. Inphi's 16nm CMOS PAM4 platform is based on four generations of DSP engines. The new devices will support both integrated and non-integrated driver capabilities spanning short reach optical applications, and longer distances of fiber enabled by the use of an external driver. Inphi announced production availability of its IN6450TA 64 Gbaud dual channel linear TIA/VGA amplifier, and that its 32 Gbit/s quad linear TIA with analogue and digital SPI interfaces and second-generation single chip quad channel linear driver in bare die form will be combined as a chipset to address the requirements of 100/200 Gbit/s coherent systems for metro and long haul applications. Inphi has announced production availability of its IN6450TA device, claimed as the first 64 Gbaud dual channel linear TIA/VGA amplifier, offering support for data rates of 400 to 600 Gbit/s per wavelength and targeting long haul, metro and data centre interconnect (DCI) applications. The company noted that with growing demand for bandwidth, service providers and data centre operators require more efficient technologies, such as flexible coherent DWDM transmission capable of changing transmission capacity and reach on demand. This capability is enabled through the use of components capable of supporting multiple modulation formats and baud rates; the IN6450TA is designed to work with modulation formats supporting data rates of up to 600 Gbit/s on a single wavelength. 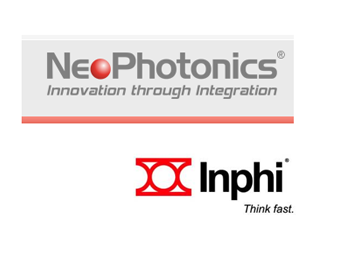 Inphi stated that it worked with NeoPhotonics on the design of the IN6450TA and its incorporation into NeoPhotonics' 64 Gbaud micro-ICR targeting applications in high-density line cards and pluggable transceivers. The IN3254TA and IN3226DZ devices are designed to be integrated to enable higher density, lower cost solutions for emerging coherent optical sub-assembly (COSA) components. COSA implementations are designed to enable delivery of the newly proposed CFP2-DCO form factor, as well as provide the more compact, lower cost ACO modules with higher port-count line cards for 100/200 Gbit/s coherent transmission applications. 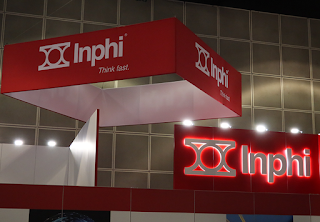 Inphi noted that for 100 Gbit/s, a major part of the growth is attributed to the CFP2 coherent modules expanding the addressable market for pluggable transceivers. The company's new transceivers are intended to enable the next generation of 100 and 200 Gbit/s networking infrastructure for metro and inter-data centre markets, where smaller size, lower cost and pluggable modules are the key requirements. Inphi, a provider of high-speed interconnect solutions, announced the commercial availability and production ramp of ColorZ, which it claims is the first silicon photonics 100 Gbit/s PAM4 platform for 80 km DWDM data centre interconnect (DCI) in QSFP28 form factor, and introduced the Polaris 16 nm CMOS PAM4 solution. First unveiled at OFC 2016, Inphi's ColorZ utilises advanced PAM4 signalling and is able to support up to 4 Tbit/s of bandwidth over a single fibre, allowing multiple data centres located within 80 km of each other to be connected and behave as a single data centre facility. The ColorZ DWDM platform offers key features including: support for 100 Gigabit Ethernet; extended reach up to 80 km; 4.5 W power dissipation; compatibility with ITU wavelength grid; InphiNity core DSP engine with a mixed-mode DSP architecture for low power applications requiring adaptability and configurability; and multiple programmable FEC options, with varying levels of pre-FEC BER performance. At OFC 2017, Inphi is carrying out live interoperability demonstrations of its ColorZ QSFP28 solution, including driving 3.6 Tbit/s of bi-directional east-west traffic over 80 km of fibre between two Arista 7500R platforms, and 100 Gbit/s line cards connected via AVDA direct detect Open Line System (OLS) with SmartAmp technology. 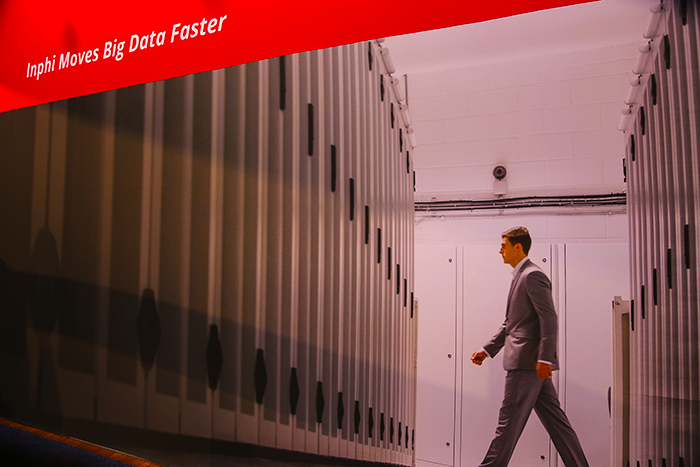 The demonstration is designed to showcase the simplicity and plug-and-play capabilities of the ColorZ technology, and to demonstrate its ability to offer a cost-effective solution for edge data centre connectivity. Inphi's new Polaris offering is claimed to be the first 16 nm CMOS PAM4 solution for next-generation cloud deployments and includes the company's integrated, low power PAM4 DSP IC and low power linear driver and TIA for data centre connectivity. 1. Polaris-400G, 8 x 56 Gbit/s PAM4, 16 x 28 Gbit/s NRZ gearbox for CFP8. 2. Polaris-400G (NG), 8 x 56 Gbit/s, 8 x 56 Gbit/s PAM4 retiming for OSFP/QSFP-DD. 3. Polaris-200G, 4 x 56 Gbit/s, 4 x 56 Gbit/s PAM4 retiming for QSFP56. 4. Polaris-100G, 2 x 56 Gbit/s, 2 x 56 Gbit/s PAM4 retiming for QSFP28. 5. Polaris-50G, 1 x 56 Gbit/s, 1 x 56 Gbit/s PAM4 retiming for SFP56. The Polaris products also feature the InphiNity DSP engine with mixed-mode DSP architecture, a range of self-test and loopback modes for diagnostic monitoring of channel and system parameters, eye-scan, samplers and monitors on receiver interfaces, and API routines for data and error analytics. Inphi noted that its IN2834 28 Gbaud low power quad linear driver: and IN2864 28 Gbaud low power quad linear TIA for PAM4 optical modules are currently sampling to lead customers. 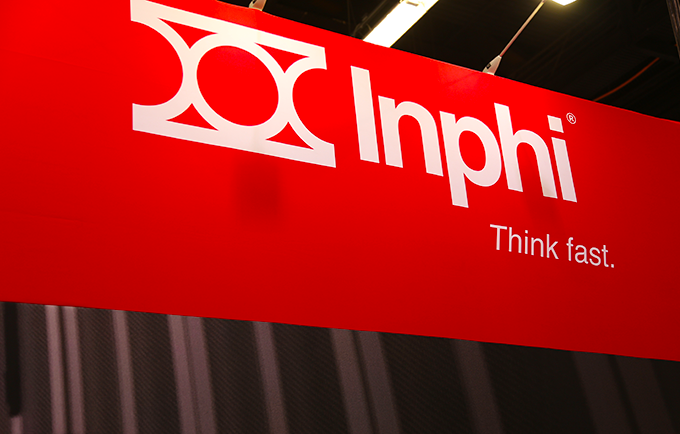 Inphi, a supplier of high-speed data transfer interconnects, announced sampling of its IN6417SZ device, claimed to be the first 64 Gbaud quad linear differential to single-ended Mach-Zehnder modulator driver delivered in a 14 x 9 mm SMT package. The new 64 Gbaud SMT quad linear driver, which follows the companies announcement at ECOC 2016 of 64 Gbaud TIAs, extends Inphi's 64 Gbaud product portfolio that targets next-generation 400/600 Gbit/s coherent, long haul and metro optical interconnect applications. Inphi noted that with growing demand for bandwidth, service providers and data centre operators are demanding more efficient technologies, such as flexible coherent DWDM transmission, which require components capable of supporting multiple modulation formats and baud rates. 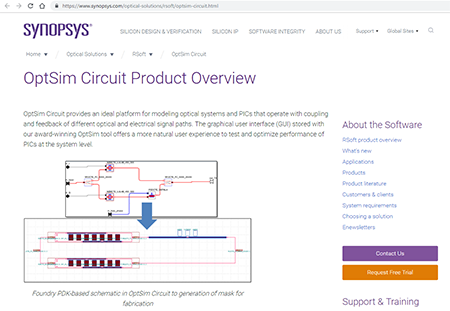 The new IN6417SZ product is designed to work with higher order modulation schemes for a range of data rates up to 600 Gbit/s on a single wavelength. Inphi previously announced sampling of the IN6450TA 64 Gbaud dual channel linear TIA/VGA amplifier at ECOC in September 2016. 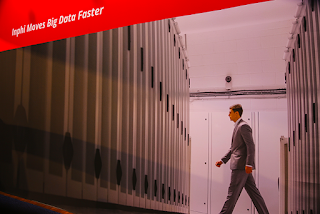 The device supports data rates up to 600 Gbit/s per wavelength for long haul, metro and data centre interconnect networks using coherent technology. In November 2016, Inphi announced a definitive agreement to acquire ClariPhy Communications, a provider of ultra-high-speed systems-on-chip (SoCs) for multi-terabit data, long haul and metro networking markets. ClariPhy specifically offered coherent DSP technology for long and short reach DWDM applications. Inphi noted at the time that the acquired technology would enable it to offer coherent DSP, TIA and drivers for long haul and metro markets, direct-detect PAM DSP-based solutions for DCI edge applications and NRZ and PAM short reach solutions for inside the data centre. In addition, in components it stated that ClariPhy would bring TIA, driver, silicon photonics, coherent DSP, PAM and NRZ physical layer technology. Inphi completed its previously announced acquisition of ClariPhy Communications for $277 million plus the assumption of certain liabilities. 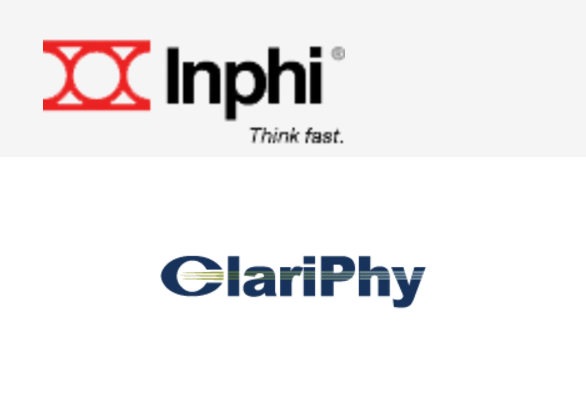 "By finalizing the ClariPhy acquisition we achieve an important milestone in offering a platform for optical networking customers," said Ford Tamer, President and CEO of Inphi Corporation. 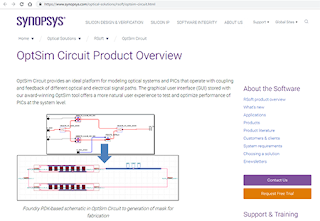 "The ClariPhy coherent DSP complements Inphi TiA, driver, optical PHY and silicon photonics components to provide system OEM and module customers high-performance and low-power platform solutions. We believe this will provide customers with faster time-to-market, proven quality, and competitive cost." IHS estimates the total available market for 100G & 200G coherent optical network hardware will grow at 18% CAGR, from $3.2 billion to $7.4 billion, between 2015 and 2020. This growth will be driven by several concurrent, powerful tailwinds: the current optical super cycle, a growing and expanding SAM (serviceable available market), opportunities in regions such as China and with new markets such as Cloud. Inphi, which supplies high-speed data movement interconnects, agreed to acquire ClariPhy Communications, a provider of ultra-high-speed systems-on-chip (SoCs) for multi-terabit data, long haul and metro networking markets for $275 million in cash as well as the assumption of certain liabilities at the close. ClariPhy is one of only three merchant suppliers of coherent DSP technology. The company is based in Irvine, California. On the product front, following closing, Inphi expects to be able to offer customers (1) coherent DSP, TiA, drivers for long haul, and metro, (2) direct detect PAM DSP-based solutions for DCI edge between data centers, and (3) NRZ and PAM short reach solutions for inside data centers. On the component front, following closing, Inphi expects to be able to offer TiA, driver, silicon photonics, coherent DSP, PAM and NRZ physical layer devices. Inphi announced a 400GbE platform solution for next-generation 400G CFP8 modules. The solution uses Inphi's highly integrated, lowest power 4-level Pulse Amplitude Modulation (PAM4) digital signal processing (DSP) IC, which supports IEEE P802.3bs 400G/s Ethernet standard alongside its linear TIAs and linear drivers for client based cloud interconnects. Inphi said its the foundation of its 400G PAM4 PHY IC is a highly configurable and DSP Engine that can be targeted to multiple different performance oriented applications for optical based interconnects, while keeping an extremely low power profile. The solution multiple channels along with transmit and receive PAM4 and forward error correction (FEC) functions on a single package. Inphi unveiled a QSFP28 reference design that uses advanced Pulse Amplitude Modulation (PAM4) signaling to deliver up to 4 Tbps of bandwidth over a single fiber at distances up to 80km. The target application is metro Data Center Interconnect (DCI). Commercial launch date was not specified. 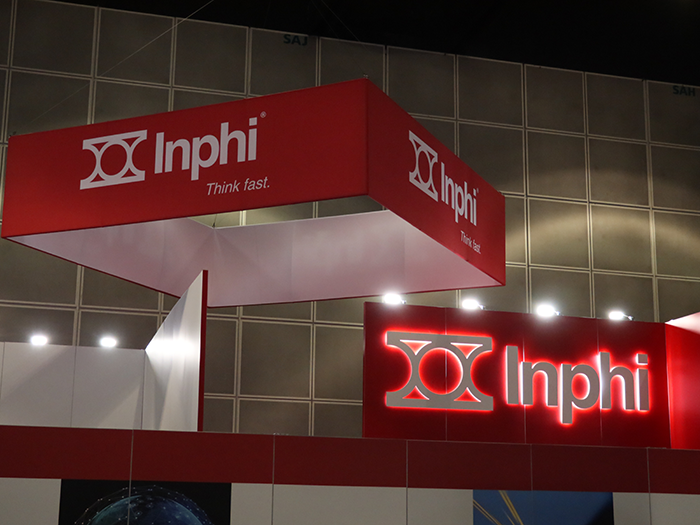 Inphi announced a highly integrated Silicon Photonics (SiPho) chip that includes multi-channel modulators, photodetectors, multiplexers, demultiplexers, optical power monitors and fiber coupling structures on the same integrated circuit (IC). The chip is targeted at 100G intra and inter data center optical interconnects. The company said it expects a 100G upgrade cycle in data centers to begin this year with the introduction of a new generation of 3.2T switches using QSFP28 pluggable transceivers. Inphi believes its SiPho technology, coupled with its low power DSP-based PAM4 and linear amplifiers/drivers, will deliver the industry’s first 100G DWDM PAM4 platform reference design for the QSFP28 form factor. 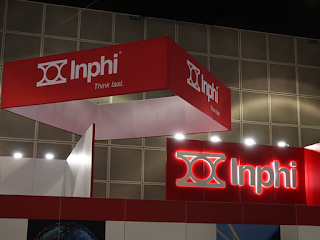 At this week's ECOC 2015 in Spain, Inphi is demonstrating interoperability of the industry's first 4-level Pulse Amplitude Modulation (PAM4) PHY IC chipset solution for service provider interconnects. The demonstration showcases 100G dual lambda optical link performance with 2-10km SMF fiber loopback featuring Inphi's PAM4 IC solutions and NeoPhotonics' Q-TOSA 100G EML-based modules. This demonstration shows that transferring the complexity from optics into CMOS electronics with PAM encoding, DSP and FEC technologies, one can attain four times as much bandwidth improvement compared to existing solutions, at a lower cost. The companies said PAM4 modulation is the modulation scheme that will take the industry over the next wave of Ethernet deployments for optical and copper interconnects by doubling the bits per symbol at the same baud rate. "Our interoperability demo with ecosystem partners, such as NeoPhotonics, achieves excellent bit-error-rate and optical link budget, and proves that the PAM4 technology is ready and available today to help designers build IEEE P802.3bs 400G LR8 line cards and modules for next generation service provider platforms," said Siddharth Sheth, vice president, Networking Interconnect, Inphi. "This joint demo with Inphi PAM4 chip demonstrates the ability of our very high bandwidth EML to generate superior performance in High Order of Modulation (HOM) based platforms. It has been proven at both 28GBaud and 56GBaud, which will enable future systems with higher link capacity to serve the continuous market demand for increased bandwidth," said Tim Jenks, CEO of NeoPhotonics. 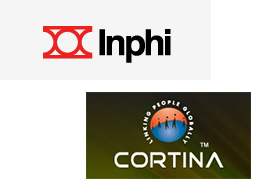 Inphi Corporation, which supplies high-speed, mixed signal semiconductor solutions for the communications, data center and computing markets, agreed to acquire Cortina Systems' High-Speed Interconnect and Optical Transport product lines for $52.5 million in cash and $73.5 million in stock. The acquisition does not include Cortina’s Access and Digital Home business, which is currently scheduled to be divested prior to the acquisition close and will continue as an independent company. Inphi said the acquisition will solidify its position as a leading-edge supplier of optical and networking interconnect solutions while further extending its product portfolio for the fast growing enterprise and cloud data center markets. Inphi’s Networking Interconnect products with their leadership in 100G SerDes and CDR, will be complemented with 10G/15G/40G PHY interconnects, thus completing a high growth product portfolio and creating a market leader for high speed networking interconnects. NeoPhotonics and Inphi announced shipment to multiple customers of a new High Dynamic Range-Integrated Coherent Receiver (HD-ICR) in production volume. The HD-ICR couples the high dynamic range, low noise and high input current handling capabilities of the Inphi IN3250TA TIA with the high sensitivity of the NeoPhotonics photodiodes and is designed to deliver the high performance that is necessary for next generation 100G colorless coherent transmission systems. The companies said "colorless" optical transmission is more efficient because add/drop ports are not limited to fixed predetermined wavelength channels, meaning any wavelength channel can enter or exit any port. However, colorless operation improves the efficiency and cost of coherent transport networks but places additional requirements on receiver performance. For colorless applications where the remaining channels are not filtered out optically, the incoming signal power can vary significantly depending on how many other channels are present, resulting in up to 100 times higher optical power falling on the receiver than in the single channel case. For this case, NeoPhotonics integrates a PIC variable optical attenuator that is designed to set the incoming optical power at the optimum point to avoid saturating the detector, while the high dynamic range and low noise of the Inphi IN3250TA enables the desired signal to be reproduced with high fidelity. For the case where a single wavelength enters the receiver, the high sensitivity of the HD-ICR may eliminate the need for optical pre-amplifier in front of the receiver -- reducing cost and simplifying operation.